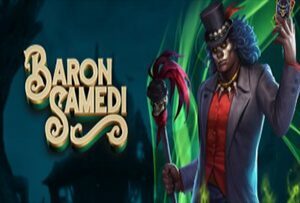 The leading developer of online casino content Yggdrasil Gaming has expanded its portfolio of video slots by launching a new game titled Baron Samedi. The new release draws its inspiration from the Haitian Voodoo tradition, featuring the loa, or spirit, of the dead, which is often depicted with a top hat, black tailcoat, dark glasses and cotton plugs in the nostrils. And although the game’s theme may appear dark, Baron Samedi slot features vibrant colours, with plenty of green, purple, red and blue, while the reels are populated with symbols matching the whole theme, so players will encounter Voodoo dolls, colourful gems, and even Baron Samedi himself, who is also the highest-paying icon. This is a five-reel three-row slot, offering a lot of entertaining and exciting features, which not only enhance the overall playing experience but can lead to rewarding prizes in both the Main Game and the bonus feature. One of the goals when playing this game will be collecting different Voodoo cards. When triggering the Free Spins round, which is done by landing a minimum of three free spins symbols, will award two random cards for your collections, as well as a respin, during which these cards become active. Each card offers a different boost, such as win multipliers, stacked and mystery symbols, while some can even transform icons on the grid. A total of 26 cards are available and collecting any single type may result in extra spins. As we’ve already mentioned, three or more Scatters are needed to trigger the Free Spins round, and while this feature is on, three cards will be active on each and every spin, which can lead to pretty neat payouts. Wild Reels and Random Wilds cards are the ones you want to have in your collection, especially since they can prove to be very lucrative when in combination with higher paying stacked symbols or win multipliers. There’s no doubt that Baron Samedi will be an engaging game. Its unusual theme, plenty of chances to win, and thrilling features will surely make it very popular among the punters around the world. It’s definitely worth checking out, which you can do at any online casino powered by Yggdrasil Gaming.